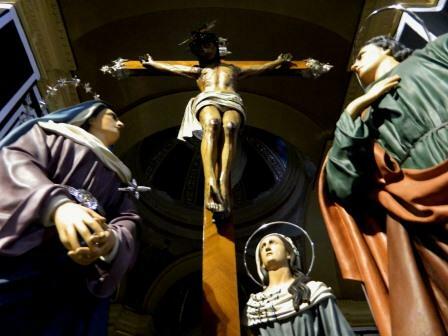 The Crucifixion, or as it is commonly referred to as the Large Statue, is actually the largest statuary group from the set of the Good Friday statues representing the Passion of Jesus Christ, at the Zejtun Parish Church. This statuary group represents the culmination of the Passion of Jesus Christ, and in fact it includes Jesus Christ crucified and already death, this suggested by the position of his head. The Virgin Mary and Saint John the Apostle are looking at Jesus, with Maria Magdalene laying on her knees under the cross. These three figures are work attributed to Carlo Darmanin (1825 – 1899), but the author of the body of Christ is yet unknown. 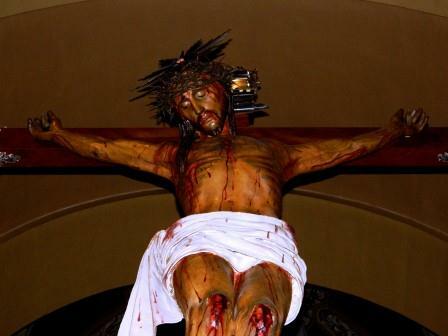 It is commonly believed that Crucified Jesus was donated to the parish by a private family. Besides the artistry shown in the composition of the statuary group, this statue is decorated with three silver finials at the three ends of the cross. 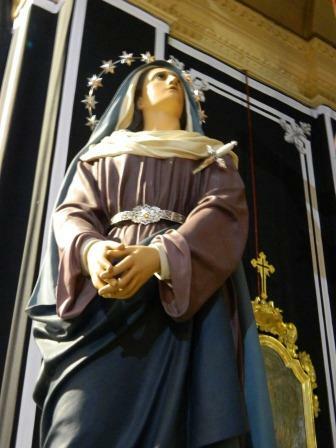 There is also a silver chalice underneath the cross, next to Mary Magdalene. However the most impressive pieces of silver ornaments are the four brackets on the front and back of the statuary group. It is worth mentioning the fact that the large timber cross is mounted on a shaft so that it can be rotated from underneath when the statue during the procession is passing through the narrow streets of ir-Raħal t’Isfel and ir-Raħal ta’ Fuq. 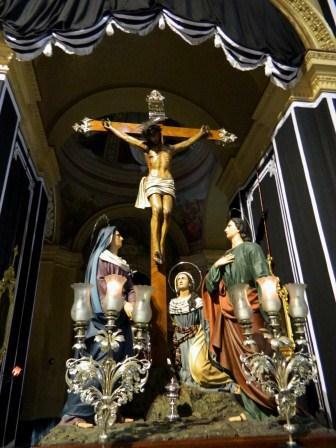 Few people know that up to the beginning of the twentieth century, the Good Friday procession used to pass through one of the narrowest streets of Zejtun – Triq Ħabel ix-Xgħir, this before Triq Santu Wistin was built.